Expendable Bathythermograph (XBT) autolauncher (from http://www- hrx.ucsd.edu/pics/Autolauncher.jpg). 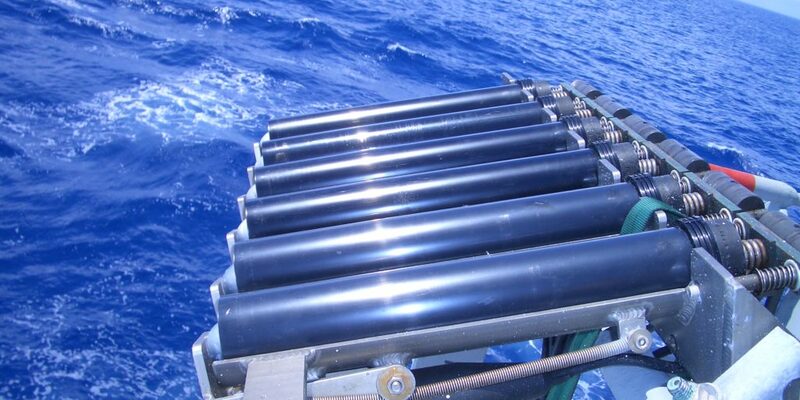 XBTs are used on research and commercial vessels to collect profiles of ocean temperature data. To develop, implement and document algorithms for assignment of “intelligent” metadata – i.e. an informed guess as to likely values for missing information – for temperature profiles where crucial metadata is missing. To evaluate and document the most effective combination of automated quality control (AutoQC) procedures for temperature profile observations. International collaboration will be required for the design and coordination of benchmarking experiments using high-quality reference datasets. To establish and implement a set of optimal automated quality control procedures, by reaching international community consensus and using the knowledge gained in the benchmarking tests from ToR-2 (above); to produce and publish a reference guide for best practices in automated quality control of ocean temperature profiles; and to develop and freely distribute an open-source quality control software toolkit to promote wide and rapid adoption of best practices by the oceanographic community. To examine and document the feasibility of machine learning and other novel computational methods for enhanced quality control, to potentially minimize labor costs associated with human expert quality-control procedures. To develop, implement and document internationally agreed best practice methods for assignment of uncertainty estimates to each temperature observation. To freely disseminate (interim) versions of the IQuOD global temperature profile database (and added-value products) as it evolves over the next 3 years, in user-friendly file formats. To share knowledge and transfer skills in instrumentation, regional oceanography, quality control procedures and data stewardship with international scientists in both developed and developing nations.